Matt Buley, Owen Ogletree, and Thel Melton. 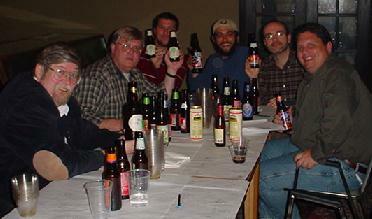 Owen Ogletree (director of Brewtopia Events) gathered together some of his devoted beer loving friends in December of 2001 at Athens' Globe pub to sample and comment on several mixed styles of ales and lagers. This beer sampling was done as a blind tasting where no one was aware of the brands that were being served. Beers were informally commented upon and ranked according to American Homebrewers Association (AHA) style guidelines. First, second, third places, and honorable mention were awarded to the beers we felt represented their individual styles in extraordinary fashion. Drop Owen an email to share your comments and opinions. The Globe is widely regarded as one of the best and most sociable pubs in Athens, GA. We gathered in the upstairs meeting room to evaluate our tasty brews. 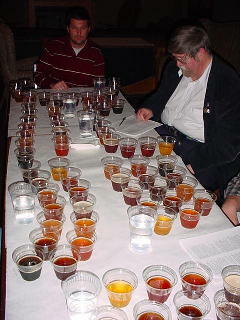 The photo to the right shows David and Johnnie looking over the nice array of colors of our 14 beers included in this tasting. Aroma: Fruity, tart, sour-like, cherries, musty, spicy, pleasantly complex. Appearance: A bit of haze, reddish color, nice head retention. Flavor: Beautiful flavors of black cherries, sourness, earthiness, hops, malt, vanilla, cinnamon, wood. Wow -- this is a delicious, complex beer. Aroma: Nutmeg, fruit, cinnamon, spice, syrup, roasted malt. Appearance: Ruby red, opaque, beautiful. Flavor: Nutmeg, malt, great balance of spice and malt, spruce-like, roasty, toffee, chocolate, dry with some hop presence, hint of coffee and allspice, very pleasant and complex. A nice holiday beer that smells like a spice cabinet. Aroma: Sweet (yet hoppy), floral/citrus, caramel aromas. Appearance: Clear, dark, reddish amber. Flavor: Hops predominate, dry, caramel, toffee notes, wood, a hint of roastiness. This is a really delicious ale for hop lovers. Aroma: Complex with hints of raspberries, raisins, plum, sherry, mincemeat pie. Appearance: Deep, attractive brown with a bit of murkiness. Flavor: Malty, caramel, slight sourness, hop flavor is low, oak hints, wine-like. Aroma: Mild with hints of citrus and lemon. Appearance: Almost clear and very light gold. Flavor: Lemon, citrus, hint of coriander, no sourness, mild phenolic flavors and very low hop presence. Aroma: Light toasted aroma with malt. Appearance: Reddish amber with bright clarity. Flavor: Low hops (good), honey notes with light toasted character. Malty in initial flavor, but finishes a bit dry. Aroma: Light toasted aroma with a hint of sulfur and a touch of hops. Flavor: A hint of sulfur, malt is low, hops are a bit high for style, body is somewhat thin and dry. This is a very drinkable beer that does not fit the Oktoberfest style perfectly. Aroma: Very mild with hints of malt. Appearance: Amber with a creamy, smooth head. Flavor: Thin body, creamy texture, smooth, hints of caramel, very mild malty flavors, no smoke presence. Aroma: Earthy, musty, malty, honey. Appearance: Full gold color, pretty. Flavor: Light caramel, honey notes, pleasantly sweet, medium/full mouthfeel, warming alcohol presence, silky, very appealing and elegant. Aroma: Butterscotch hints, overall aroma is light. Flavor: Butterscotch (diacetyl), light body, moderate hops, a hint of caramel, slightly fruity, refreshing. Aroma: Light aroma with hop notes. Appearance: Reddish brown and clear -- attractive. Flavor: Hoppy with hints of toffee, raisins, and malt. Diacetyl is somewhat low. Aroma: Smells dry-hopped with citrusy, fresh cascade-like hops, hints of grapefruit in the aroma. Flavor: Citrusy hop flavor that is medium for style. Malt flavor is moderate, and diacetyl is low. This is a nice beer that is very close to style. Aroma: Butterscotch, hops, malt. Hops smell like English hops (woody). Appearance: Nice copper, good head retention. Flavor: Woody, malty, nice malt/hop balance, medium/full mouthfeel, butterscotch, caramel. Hops don't taste piney or resin-like. Appearance: Medium gold, clear, a bit light for style. Flavor: Honey, malt, nice hop flavor, hop bitterness is medium. Hops taste piney like hops from NW America. Spicy notes and good body. Click here for more information on Athens' Globe pub!